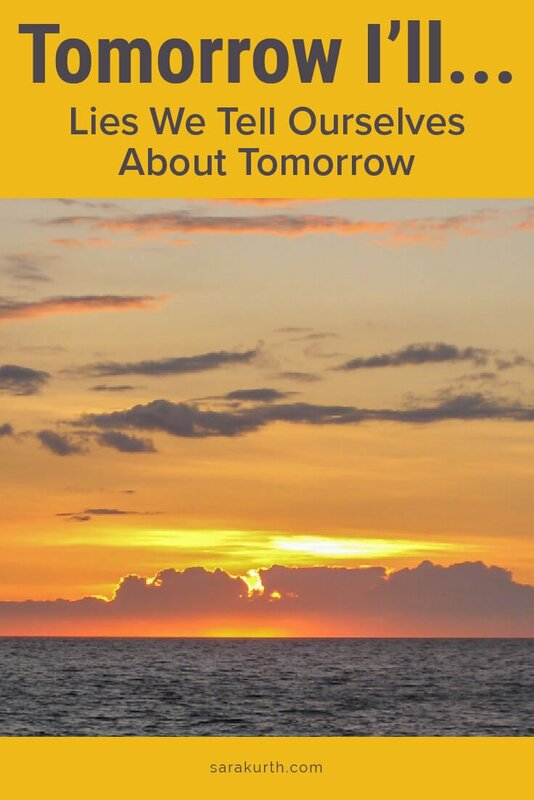 The existence of tomorrow is the biggest hurdle many of us face in achieving our dreams and accomplishing our goals. 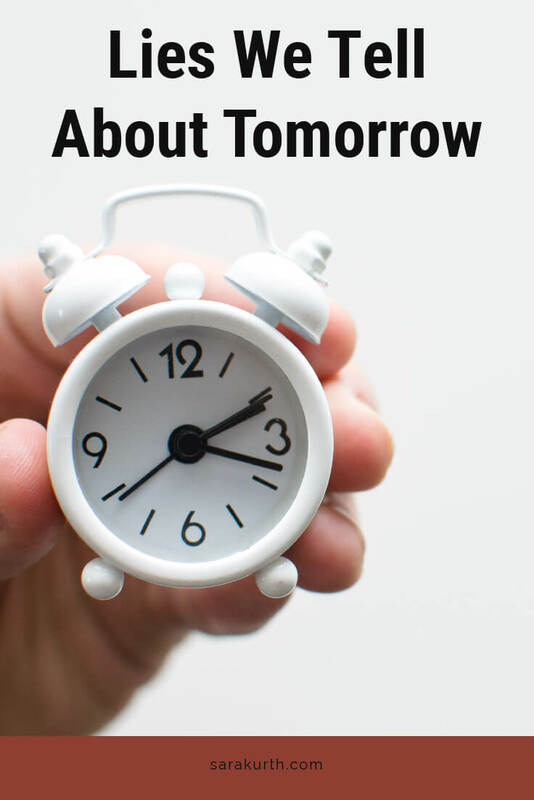 This may be due to active procrastination – why do today what you can put off until tomorrow? But it can also be well-meaning, or at least unintentional. Waiting for ‘inspiration to strike,’ for example. Annie may be a fan of tomorrow (after all, it is when the sun will come out), but I know when I’ve fallen short of my goals, or when I’ve done less than I know I could’ve, it’s usually because of what I was sure I’d get done tomorrow. I often have the grandest of intentions as I go to bed at night. Tomorrow I’ll buckle down, wake up early to start that project, workout for 30 minutes, start training for the next big event. Tomorrow I won’t get sucked into the little time wasters and dramas that keep me from accomplishing what I really want to accomplish. In almost every case, tomorrow doesn’t go any differently. I hit the snooze one too many times, I get stuck in the cycle of responding to other people’s priorities and not having enough time for my own. I’ll have no more interest in facing that difficult project tomorrow than I did today. When tomorrow comes, I’ll indulge in the same desire for comfort that kept me from acting today. As the day closes, I’ll again say to myself… Tomorrow. Even if your calendar is empty now, it won’t stay that way. Things will come up, emergencies (or more often “emergencies”) will arise, and your day will fill up with the same sort of to-dos that filled up today. You’ll be just a busy tomorrow. You just may not know it yet. Maybe you are one of the rare people who can do this, but the odds are stacked against you. But then tomorrow will turn into tomorrow, which will turn into tomorrow. You have no reason to (realistically) think you’ll be more inspired tomorrow than you are right now. OK, I’ll admit this one is a little morbid, even for me. But true none the less. No one is guaranteed a tomorrow, or a next month, or a next year. There are those stories about people who put off their dream trip to France until retirement only to get cancer or die in some freak accident in the days or weeks before retirement. Sure it’s usually a trope in the movies, but it still illustrates the point. There is nothing magical about tomorrow. If it’s good enough for tomorrow, It’s good enough for today. For the sake of this single argument, I’ll believe that you can’t take action today and that you will do it tomorrow. Before your head hits your pillow tonight, plan – specifically – what you are going to do tomorrow. Not generally (I’m going to work on that blog I’ve always wanted to start), but specifically (I am going to make a list of 5 possible blog post titles). It was waaaay to easy to put off the general. It can be harder to ignore a very specific and detailed to-do item. This is an over-used exercise, but it can still be helpful. Consider how you would spend your time if you only had a year to live. I find a year is a good length of time for this exercise. Any shorter (if you knew you’d die tomorrow…) and it can be hard to get in the mindset of considering longer-term plans. But you can get a lot done in a year, you just can’t keep waiting for tomorrow to arrive. What about you? What lies do you tell yourself about tomorrow?